Having a hard time with christmas shopping? You'll be happy to hear that we are launching winter special offers to let you purchase all our audio plugins and bundles with discounts ranging from 15 to 25%. Download the demos and try them out! The offer will end up on December 31st! Our existing customers will receive an exceptional coupon with 40% discount on the entire catalog in the coming days. Check your email! Blue Cat's Free Pack DX and VST are now available for 64 bits applications (if you are running Windows x64)! Although it has been tested for some time, this is a beta version to validate that it works on all systems out there. So please download the plugins and send us feedback! It's 100% free, and these versions can be installed together with the 32 bits versions. Both will share the same settings, so that you won't see any difference when loading projects in both 64 bits and 32 bits applications. Blue Cat's Free Pack RTAS has just been updated. Thank you all for your feedback! This updated beta fixes compatibility issues with Pro Tools Snow Leopard pre-release (8.0.3) on Snow Leopard. It also includes minor fixes and enhancements for both Mac and PC. You can find more details in the forum thread below that you can also use to tell us how it works on your system! 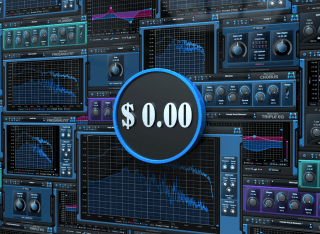 Blue Cat's Free Pack free audio plugins bundle has been updated. The big news is that new version introduces RTAS plugin format support for Pro Tools. It also includes several fixes and enhancements for the other formats, on both Mac and PC. Although it should be pretty stable now, RTAS support is still in beta, so please send us feedback by email or on our support forum. A new version of Blue Cat's Remote Control virtual control surface is now available. It now lets you dynamically change the name of the controls: no need to customize the skin! Download the free demo and check it out! Our free audio plugins bundle has been updated. The new version includes several fixes for both Mac and PC as well as new Windows installers. The 9 plugins included in the pack can now be installed all at once! We are glad to confirm that our plugins are compatible with Mac OS X 10.6 "Snow Leopard": you can use our plugins in any application that is compatible with the latest operating system from Apple. No upgrade for the plugins is necessary. 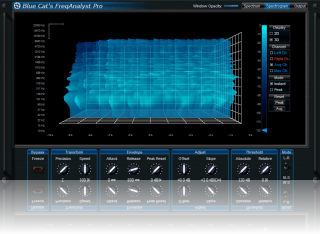 The alternate skins for Blue Cat's FreqAnalyst Pro and Blue Cat's StereoScope Pro have been updated to support the new 3D waterfall view. 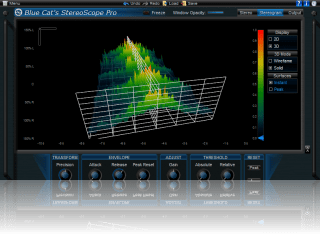 Audio analysis in 3 dimensions: we are proud to announce a new version of Blue Cat's FreqAnalyst Pro and Blue Cat's StereoScope Pro. 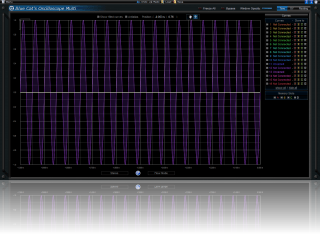 Both plugins now offer a 3D waterfall view with full 3D control for the best real time audio analysis experience. The upgrade is free for existing customers, and if you don't already own the plugins, you can get them with 15% off until the end of August. Check out this new release! It's not just one but three skins that Limeflavour has offered us this month! 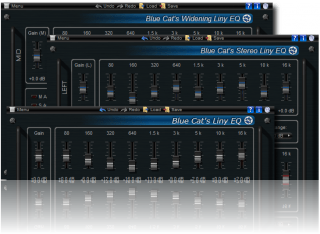 Check out his "Bronze" skins for Blue Cat's Protector, Blue Cat's Dynamics and Blue Cat's Stereo Chorus. All 3 skins are freely available for download. If you want to create your own skins for a plugin, check our skins page. Please contact us if you need any assistance. We are happy to announce that you can now share your presets for our plugins on our website! The service is available for both free and commercial plugins. As shown in this tutorial, just export your presets in our cross-platform format and send them to us. We will publish them on the appropriate page. For now you can check out the latest presets for Blue Cat's Dynamics created by Sink. Enjoy! Two new tutorials to show you how to export and import presets with your favorite Blue Cat Audio plugin have been published. 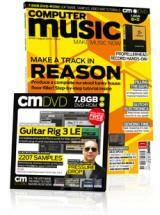 Blue Cat's Dynamics has been reviewed in the latest Computer Music Magazine issue. Our flexible dynamics processing plugin was rated 8/10 and received the performance and value awards. You can read more about this review in this month's CM issue (141) or on the musicradar website: Blue Cat's Dynamics 3.0 online review. Some sound samples are also available on the website. Blue Cat's FreqAnalyst CM Edition version 1.1 is out! This spectrum analysis plugin is exclusively available for free in the latest issue of Computer Music Magazine (CM 141), which also includes a tutorial to get started with the plugin. The new version brings Mac support (Mac OSX 10.5 requied) and installation improvements on windows. When installing the plugin you will be asked a code to enable the stereo version of the analyzer. You can obtain this code by registering Blue Cat's FreqAnalyst CM. Blue Cat Audio is now on Twitter! You can now follow our latest news on twitter. Just check our twitter page and join our network! We are happy to announce that we now offer 25% discount on all our plugins for students. Just send us an email (support[at]bluecataudio.com) with a scan or a picture of your student card to access the offers. We have just updated Blue Cat's Skinning Language to version 1.5 in order to support our upcoming products. The samples have also been updated, and an online version of the documentation is now available. Mac users will now be able to create their own skins too! We have just updated all our free and commercial VST plugins for Mac to make them compatible with Cubase 5. So if you previously encountered any issue with our plugins in Cubase 5 on your Mac, download the new versions of our plugins! All our audio plugins are now available for both Mac and PC! To celebrate the event, we have decided to grant existing customers a 25% price reduction on the entire catalog (check your email!). If you are not already a customer, you can purchase our plugins and bundles with 10% off (See the Discounts page). This special offer will only be available until the end of May, so don't miss it! Note that the Mac versions of all our commercial plugins are now available as a single download on the All Plugins Pack page. Blue Cat's Dynamics is now available in version 3.0 for both Mac and PC. Appart from Mac VST and Audio Unit support, this new version brings a brand new stereo management system, with mid/side processing capability as well as new channels linking and selection options. 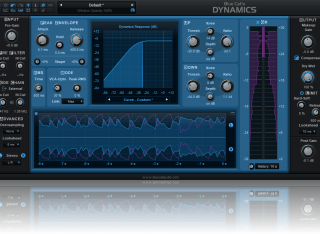 Check out all the improvements on the Blue Cat's Dynamics plugin page. A special upgrade price is available for existing customers, and others can purchase the plugin with 20% discount (one month introduction offer). Check out the demo! Check our "Side Chain in Bidule" tutorial which explains how to use the MIDI connectivity of our plugins in a modular host such as the excellent Plogue Bidule. As a side note, this is our first tutorial with a Mac :). 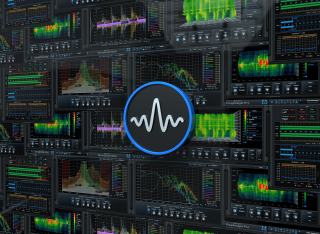 All our plugins are now available for Mac, except our all-in-one dynamics processor, Blue Cat's Dynamics. The next version will include several new features for the plugin, that's the reason why it's not finalized yet. The good news is that we are in the final beta stage, so the release is imminent! Blue Cat's Remote Control and Blue Cat's Stereo Phaser have been updated! The plugins are now available in Audio Unit and VST formats for Mac. They are now distributed with new installers and documentation on windows. These new versions also bring several improvements to the user interface and automation capabilities. If you do not already own these plugins, you can download the demo and purchase them with a special introduction offer for a limited time. The upgrade is free otherwise! If you happen to be in the UK next saturday, get your hands on our plugins at the Analogue To Digital Music Expo (Saturday March 21st)! "A day of 'hands-on' demonstrations, master-classes, workshops, Q&As and live performances all under one roof, plus a prize draw with up to £5,000 of music software and hardware up for grabs!" We have been doing it silently for a while for most our plugins, but it's now officially supported for our entire collection: we have streamlined our registration process so that you can now benefit from instant delivery when purchasing one or several plugins. You will now receive your registration email within a few minutes after your purchase! We are happy to announce the update of all our 8 commercial EQ plugins. They are now available for Mac as Audio Units and VSTs. We have also updated the windows versions for all of them. The Liny EQ series have been completely redesigned and are now available in version 4. Check out the plugins pages for more details about all these updates. For most plugins, the upgrade is free for registered users. Registered customers of the Liny EQ plugins will receive an upgrade offer to the new version shortly. And for others special introduction prices are available. We have just added two new free skins for Blue Cat's Oscilloscope Multi. One provides a much larger display and the other one a smaller one. You can easily customize them to change the display size yourself. Blue Cat Audio is now on Facebook! Want to know more about us? Want to share with the Blue Cat Audio community? check our new facebook page and join our fanclub! Post your pictures, screenshots, comments... Find out who we are and tell us who you are! Our audio analysis plugins are now officially available as Audio Units for Mac! This is also the occasion for us to refresh the other platforms (VST and DX for Windows and VST for Mac). This new version includes new Windows installers and documentation, as well as several fixes and improvements. The upgrade is free for registered users, and a 15% Audio Unit introduction discount on Blue Cat's Analysis Pack applies for others. After two public betas, Blue Cat's Free Pack Audio Units for Mac are now officially available. You can download them separately or as a single package. Thanks again to beta testers who helped us release these plugins! 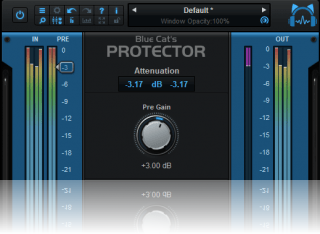 Blue Cat's Protector brickwall limiter is now available for Mac! This transparent and versatile limiter plugin now supports both Audio Unit and VST formats on the Mac. This new version also brings several improvements and fixes to the PC versions. Download the demo now, and purchase the plugin at a special introduction price! The upgrade is free for registered users. We have just released a new beta version of Blue Cat's Free Pack free plugins bundle for Mac in Audio Unit format (the VST version is already officially available). Please download it and send us feedback on our forum or by email (support[at]bluecataudio.com). We are getting close to the official release! Many thanks to all of you who already sent us their feedback about the previous beta! This new version mainly brings MIDI control support and fixes automation issues in Logic 8 for all plugins as well as coordinates display issues for Blue Cat's Triple EQ. The Blue Cat Audio Team whishes you a happy new year and great success with all your audio projects! On our side, the Mac ports are expected to be finalized in Q1, together with PC updates for all our plugins. This means that our new products will be released from our lab in the coming months. Keep connected! Our winter special offers are still available for one week until January 15th, don't miss them! The 25% discount coupon for existing customers is valid until January 15th too. Looking for older news? Please consult the 2008 News page.